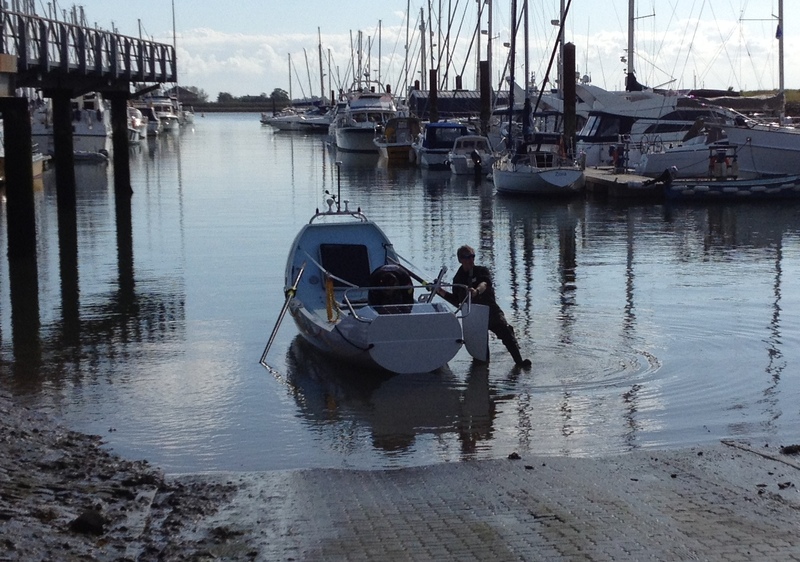 I saw this Solo dinghy when I was rowing ‘Pike’ on the River Crouch at Hullbridge. 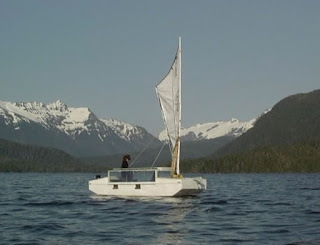 I believe she was being sailed in a handicap race, as she was with other dinghies heading for a particular buoy around which they turned before entering Fenn Creek. 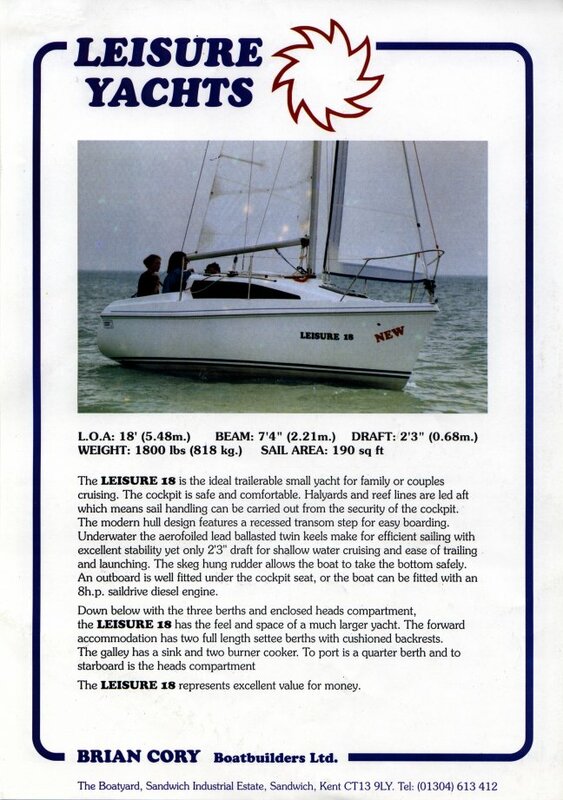 Years ago when I was younger I would have loved to have raced a Solo, but I suppose there was time and money for sailing other boats; therefore I never got around to buying one. 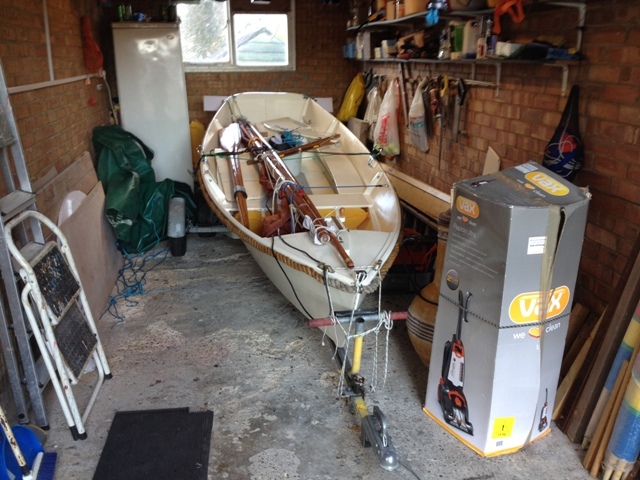 Now, I’m not agile enough or strong enough to sail a Solo safely………….. ‘Pike’ is enough to manage. The Solo dinghy was designed by Jack Holt in 1956, and ever since she has been a popular choice for those who want to race single-handed. Thousands of them have been built, both by professional builders and amateurs alike. 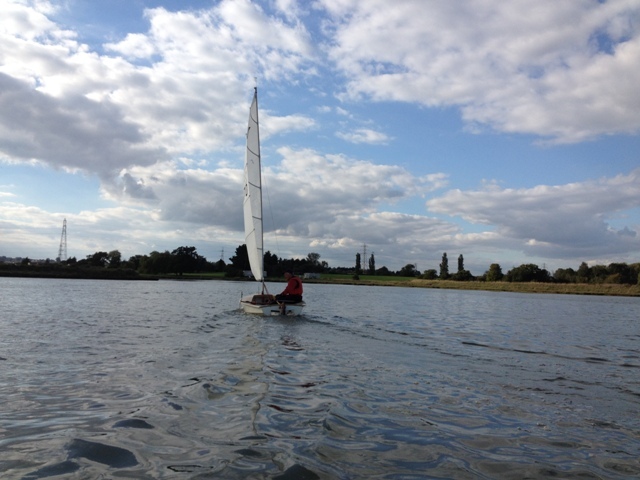 There are many clubs with Solo racing fleets in the UK, Holland and Australia. 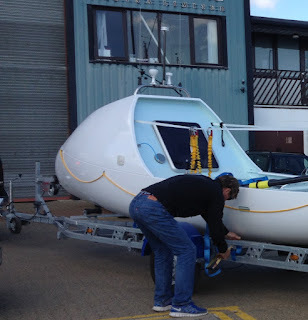 In recent years more people have rowed across oceans than at any time in history. You might say it is a modern phenomenon. However, Frank Samuelsen and George Harbo are credited with being the first to row across any ocean. 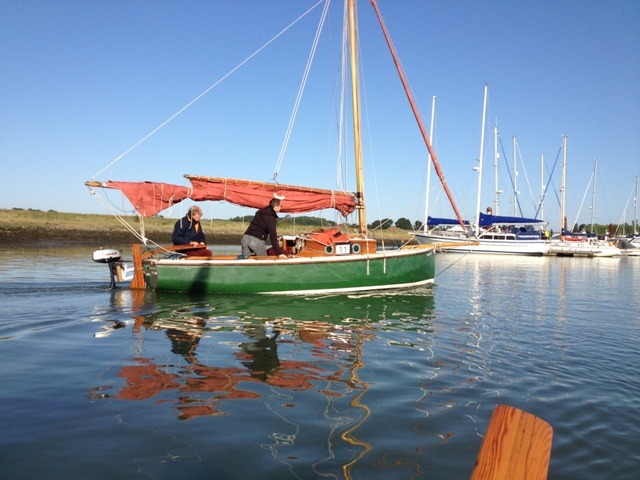 Departing from Battery Park, Manhattan on 6th June 1896, they rowed across the Atlantic to the Scilly Isles, taking 55 days. 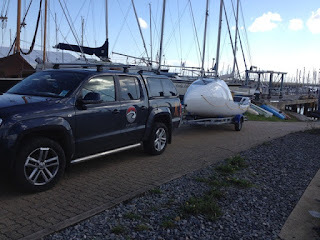 From there they rowed to Le Havre, in France. 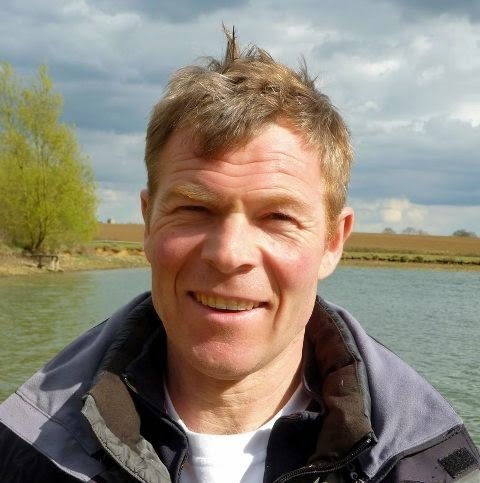 John Fairfax became the first person to row solo across the Atlantic Ocean. That was in 1969. 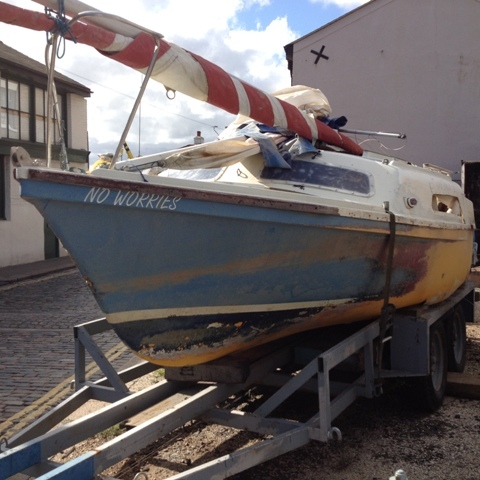 Setting off from the Canary Islands he arrived in Florida after being at sea for 180 days! Not satisfied with that, he, along with Sylvia Cook, became the first couple to row across the Pacific. 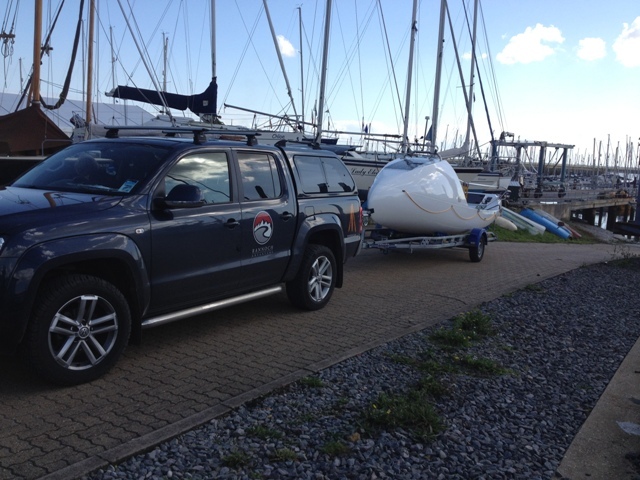 They put to sea from San Francisco on 26th April, 1971, and after 361 days they arrived at Hayman Island, Australia. When I met Charlie he was helping to launch one of his ocean rowing boats, designed and manufactured at the Ocean Rowing Company. *** The photos above were taken at the time, and they give a snapshot of view of the high-tech vessel. 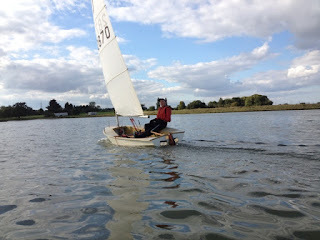 When it comes to having a sail, good weather makes a big difference. Yesterday’s was perfect, and the most important aspect was the character of the wind – its direction and speed. 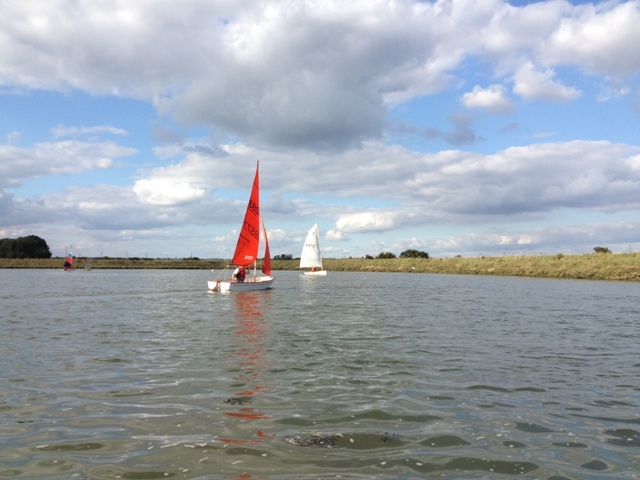 The wind was generally from the north and never more than a Force 2, which was ideal for exploring Bridgemarsh Creek, a backwater where I seldom sail, on account of it being shallow and because the prevailing wind is from the SW. 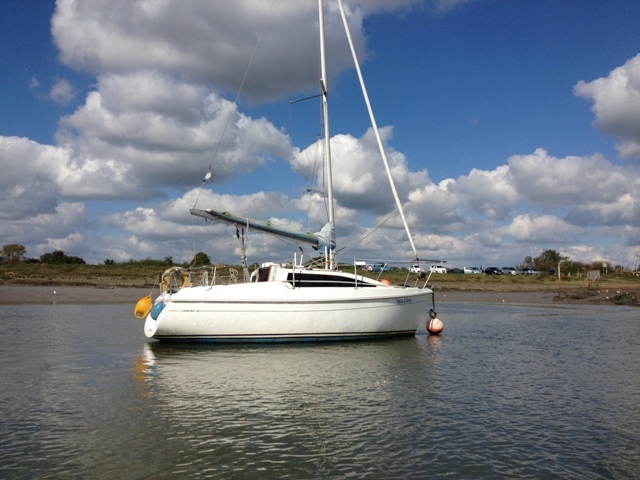 It is best done when the tide is making, so that if the boat gets stuck on the mud she will float free. Burnham high water was at 1140, and by arriving at the eastern entrance of the creek at 1015 I had ample time for a leisurely sail to the exit at the other end before the ebb. The flood tide enters at the eastern end, and on approaching the creek I felt the speed of water increase. 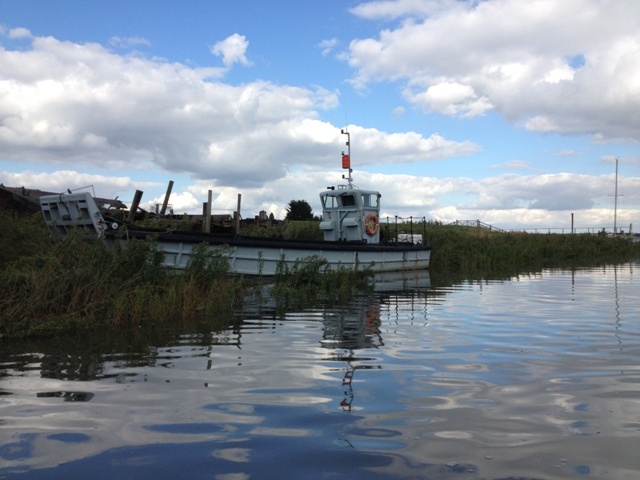 ‘Pike’ was being lee-bowed into the narrow orifice from where I could see the masts of yachts poking up above the muddy bank of Bridgemarsh Island. I was amazed at how quiet it was - the only sound I could hear was that of tiny wavelets slapping ‘Pike’s’ bow. 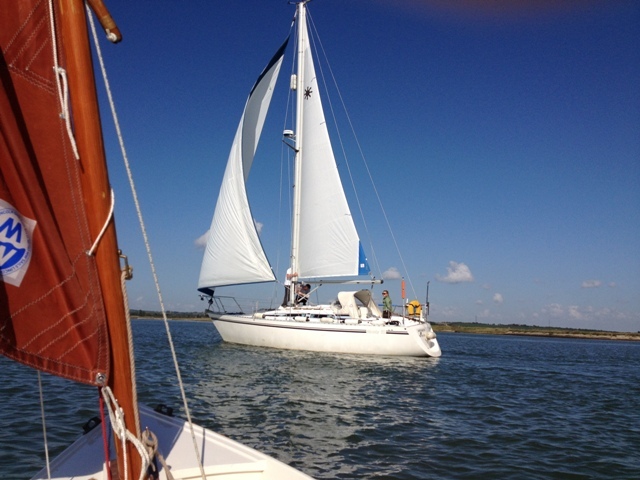 These happy, chuckling notes, resonated by her bow chamber, lifted my soul; as did the dancing peak of her tanned sail that jigged to and fro before an infinite, azure, cloudless sky. 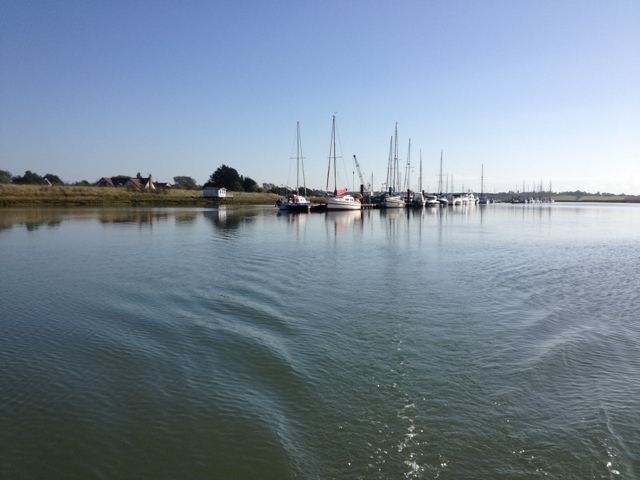 Around the corner, two scruffy buoys marked the channel, and there ahead lay many yachts berthed at pontoons that straddled the creek. 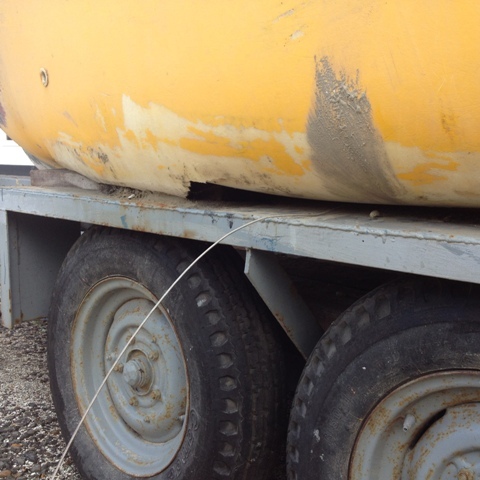 Uncertain if they were linked to the northern shore by walkways, I chose to glide through a gap to the south of them. 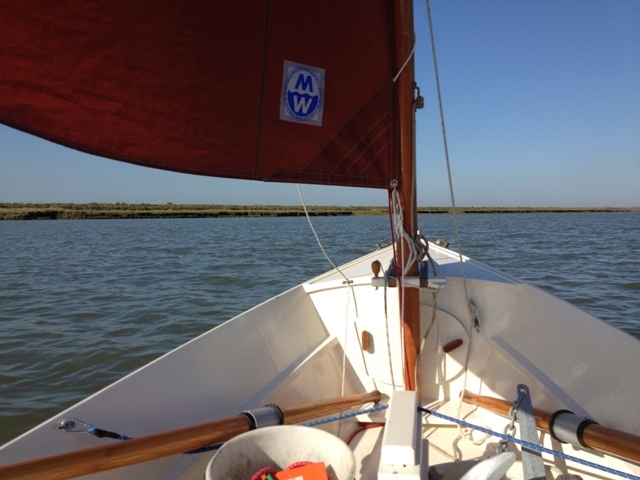 I wove a course between clumps of motionless weed floating on the surface, and I occasionally glanced astern to see if any had lodged on the rudder. This was an adventure. Having no chart and no GPS, it was back to basics. Deeper water was generally to be found closer to steep-sided banks, but I came to a point near the end of the creek where there appeared to be an island, one that I could not remember being there on previous excursions. 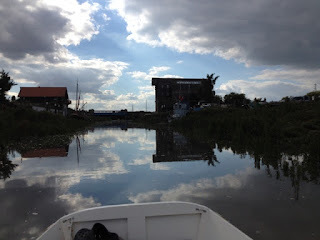 To starboard and beyond it, I could see a high bank along which runs a footpath from North Fambridge Yacht Station to Bridgemarsh Marina. A choice had to made, which side of the island to go, and I chose the wider stretch of water to the SW, beyond which I could see what looked like the exit leading to the Crouch. Once again, back on the river, I was free to take a break and to have an early lunch. I brailed the sail and left ‘Pike’ to her own devices. 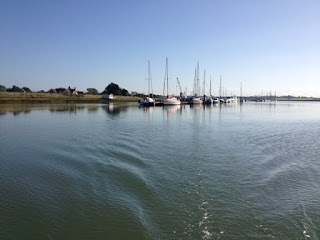 She very slowly drifted towards the Fambridge moorings while I relaxed, munched and took in the many comings and goings of yachts and motorboats. I was reminded that it was a Saturday, and like me, all of us were there seeking what pleasure we could find. 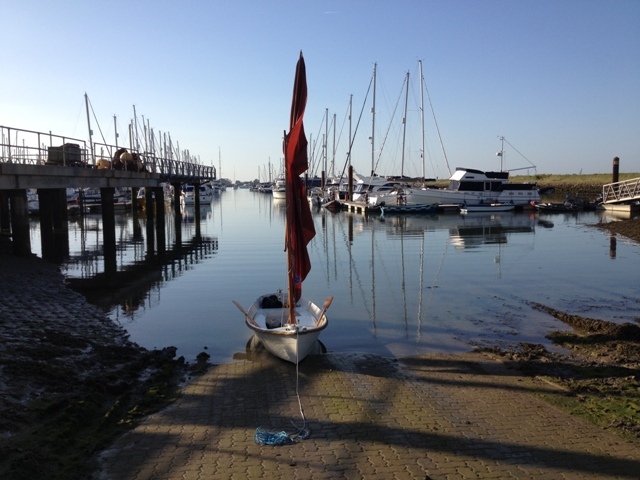 Therefore I could not grumble when my little boat was tossed like a cork on the wakes of gin palaces, of which there were several, seemingly taking part in manoeuvres resembling a naval exercise. They proceeded down river in convoy to a distant buoy and returned to the Fambridge moorings. As I made sail and got under way for Burnham Yacht Harbour the wind veered, causing ‘Pike’ to be close-hauled, but the sailing was delightful. I lay on the floor of the boat with my feet facing forwards elevated on the thwart; I held the tiller with my raised right hand and the sheet in my left. I felt the wind on my cheek, inhaled the fragrant air and thanked God for His love and kindness to me. Back at the Yacht Harbour I skipped past the queue of motor yachts waiting for fuel, and the boat came to a gentle halt at the slime-covered slipway, the tide having fallen several feet. Getting ‘Pike’ on her trolley past the green sludge without sliding and landing on my backside required patience and tiny steps taken with caution. 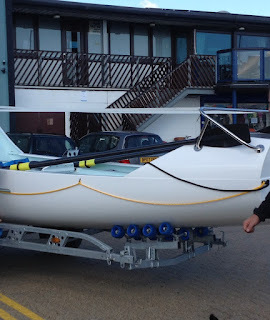 Just before leaving the Yacht Harbour for the journey home, I had the privilege of meeting Charlie Pitcher who was there helping someone launch a two man rowing boat manufactured at Charlie’s yard. 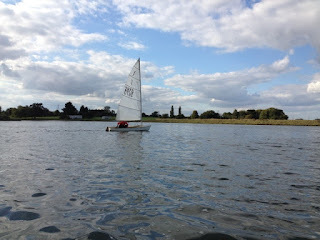 This is to let readers know that I had a super time sailing ‘Pike’ today. The photo taken at the slipway of Burnham Yacht Harbour is an appetizer. There will be more to come tomorrow, along with a short account of our ‘voyage of exploration’ into Bridgemarsh Creek. 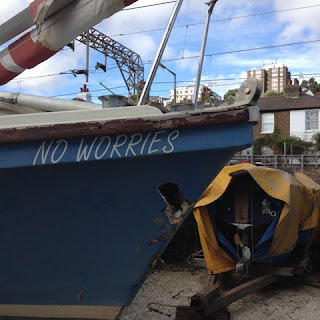 I couldn’t resist taking photos of ‘No Worries’, a wrecked Matilda 20 trailer sailer. If the owner didn’t have any worries before she got into this state, it’s pretty clear he’s gone past worrying! Seriously, Matilda 20s have been a success story, especially in Australia and Canada. 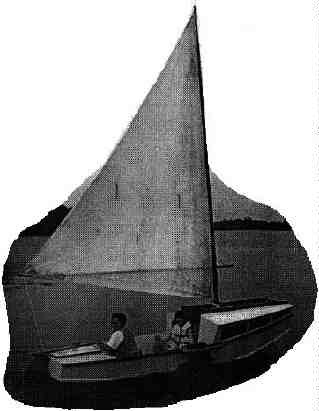 They were designed by Robert Tucker who also drew the lines of similar small boats for amateur construction; as such they were made from plywood and they were hard-chined. Some of them were built in large numbers; for example, the Silhouette, the Caprice and the Debutante. 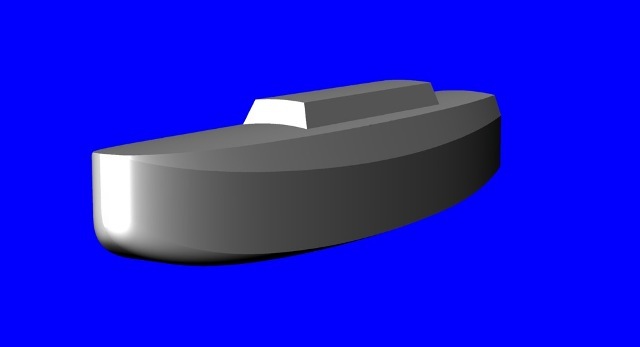 Subsequently, later models were re-designed for professional production in GRP which lends itself better to round bilge construction; hence, boats were modified, and different manufacturers under licence added their own touches. 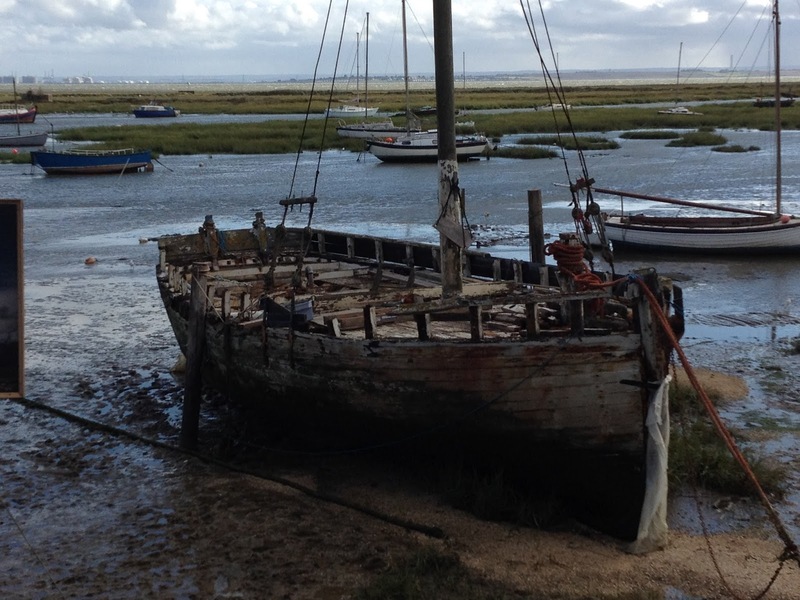 At Leigh-on-Sea, close to Belton Way Small Craft Club*, I saw what appeared to be a rotting bawley, and sure enough that’s what she was. 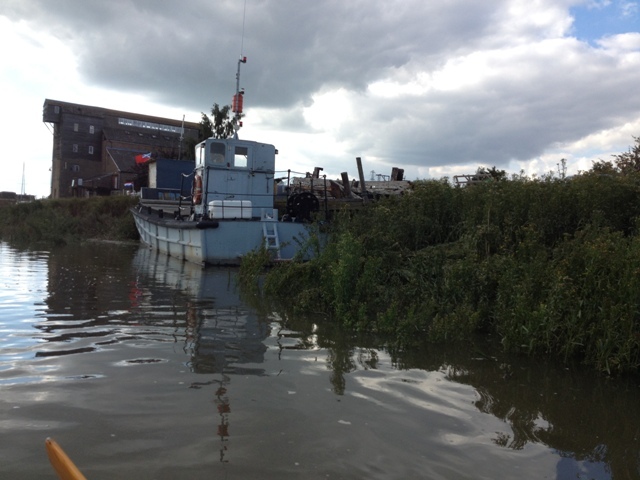 A large notice informed me that she was the ‘Souvenir’, a 40’ Thames Bawley and that she had been recovered from Leigh Marsh to be a principal feature in a project with the theme and title, ‘Graveyard of Lost Species’. 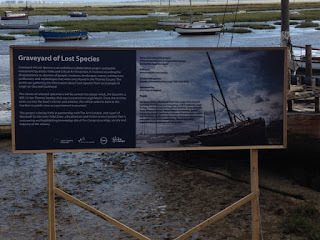 This involves the recording and preservation of things and happenings from the past in and around Leigh-on-Sea and neighbouring Southend-on-Sea. The subject matter encompasses people, creatures, landscapes, events, architecture, professions and mythology that were once found in the locality of the Thames Estuary. 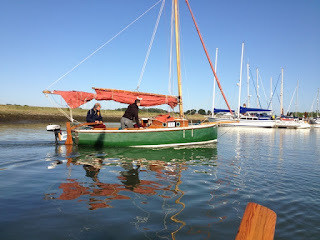 I would prefer to have seen a restoration and preservation project, whereby ‘Souvenir’ would have been bought back to life, used and maintained as a hands-on example of a Thames bawley, similar to nearby ‘Endeavour’, a Leigh Cockle bawley. 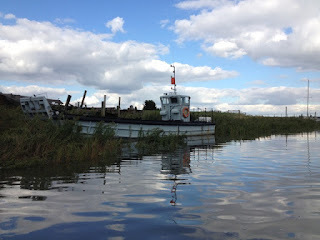 When Pike and I were in the company of Rat and Mole ( http://bills-log.blogspot.co.uk/2015/09/messing-about-with-pike-rat-and-mole.html ) last Saturday, we happened upon a fascinating floating object nestled amongst the reeds at Battlesbridge, and a little research has revealed it probably was an ex-Royal Marine LCVP. 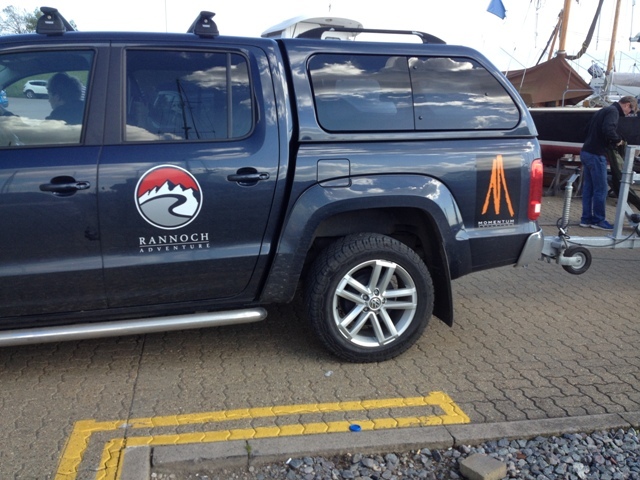 The letters stand for Landing Craft, Vehicle and Personnel. 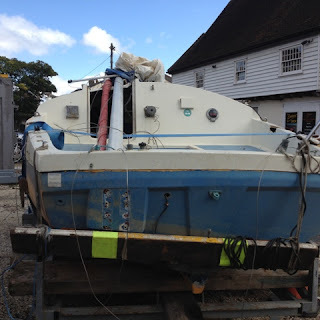 Such vessels were used by the Royal Marines for transferring assault personnel and their vehicles from ship to shore, being designed with a flat ramp at the bow that can be lowered for quick and easy access to a beach. Many LCVPs* were built by the Dorset Yacht Company at Poole in 1965. 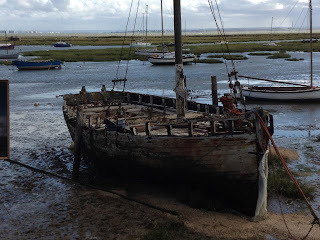 I have since discovered that this particular Landing Craft named ‘Explorer’ is used for seal watching and bird watching at Foulness and associated islands such as Potton, Havengore and Wallasea, via creeks branching off the River Roach. Rat and Mole were smitten by more than exciting possibilities of adventures and happenings - if only they could stow aboard this unusual water craft. No doubt when we meet again I shall hear all about them. *I’m not sure what version or Mark it is – possibly a Mk 2. 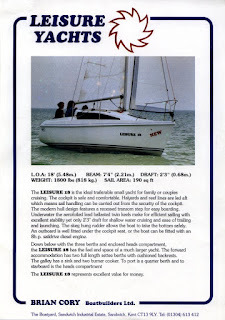 Approximately 4,500 Leisure branded yachts were built between 1967 and 1995, with a variety of designers being involved in producing a range of boats: L17, L17SL, L18, L20, L22, L23, L23SL, L24, L26, L27, L27SL, and the L29. 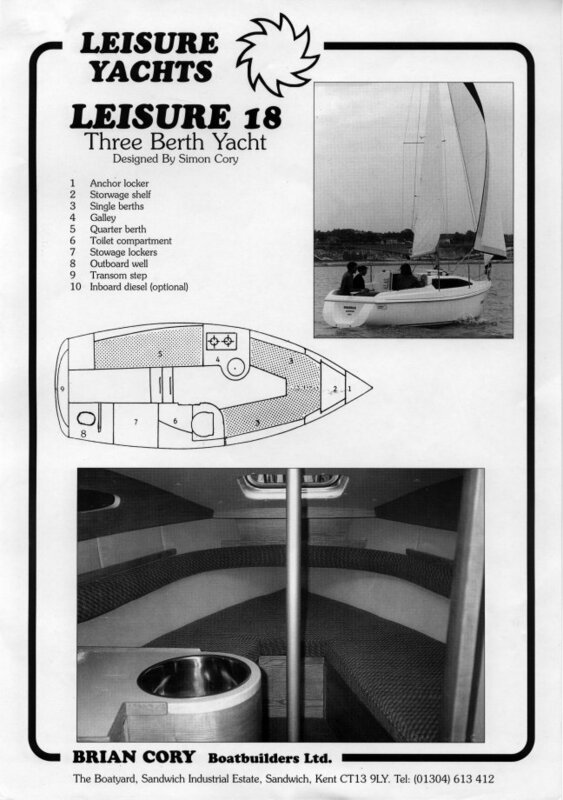 The Leisure 18 was designed by Simon Cory, and they were built by Brian Cory Boatbuilders Ltd., Sandwich, Kent, CT13 9LY. 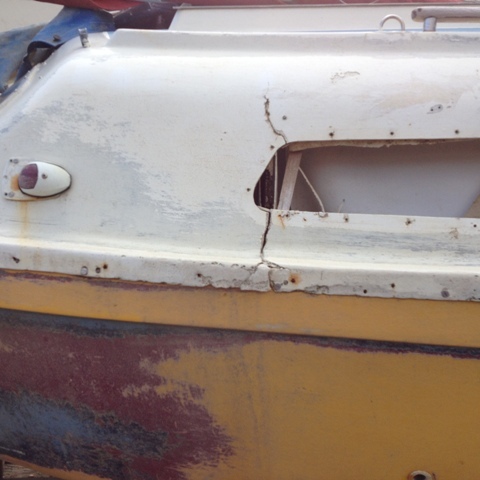 Very few were sold on account of the exorbitant cost of production because of having to satisfy the RCD (Recreational Craft Directive) requirements and the state of the market in 1970 when she was first built. 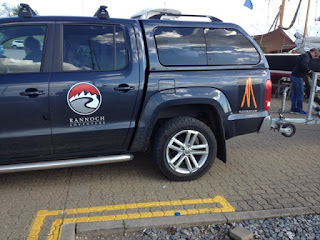 High production costs inevitably precluded profitability which brought the demise of the venture. 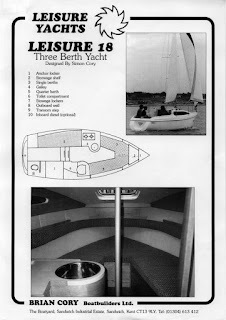 I personally think this was very sad, because on the face of it, the Leisure 18 was well designed for its purpose, i.e., for short-handed cruising and for weekending. 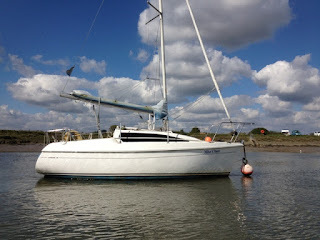 The standard boat had three full-size berths, a separate heads, and a galley with a two-burner stove and a sink. 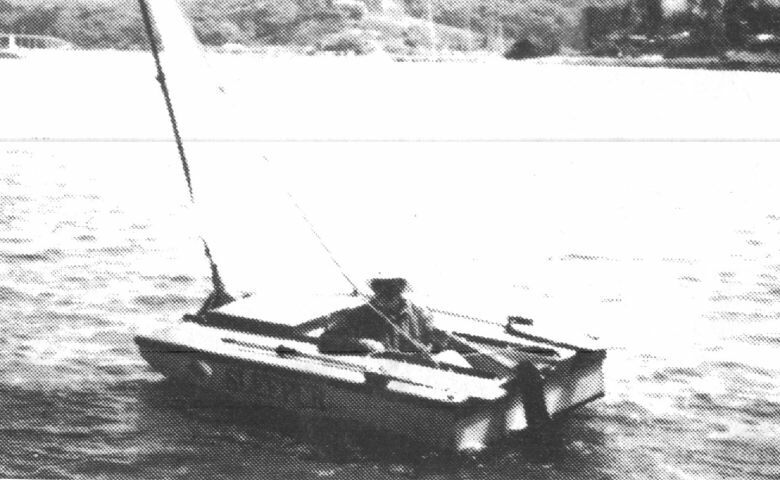 There was also a four berth version based on the same one- piece moulded hull with integral twin keels and a skeg mounted rudder. Her shallow draught of only 2’ 3” made her suitable for estuary ramblings and for exploring tidal creeks. There was the option of an outboard in a well or an 8 HP Saildrive diesel engine. 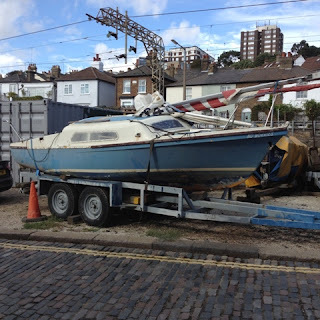 Some would describe her as a trailer sailer, but she’s really a yacht that would most likely have her own mooring, and yet she is small enough to be transported on a road trailer for that special summer cruise. 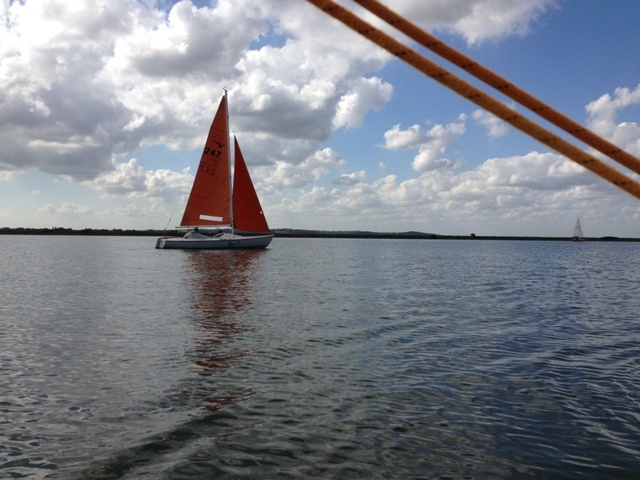 “And don’t I know it Rat!” was my reply ……… And off we went! 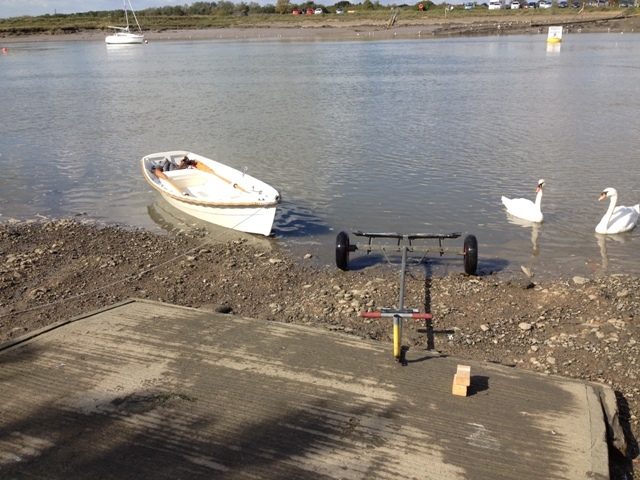 That’s what it was like this afternoon when I set to the oars, or should I say ‘sculls’, in view of the renowned company I was in. The objective was to row towards Battlesbridge and to have an interesting time. 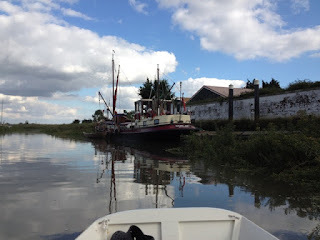 Hopefully we would return to Hullbridge before sunset - better still, in time for tea. 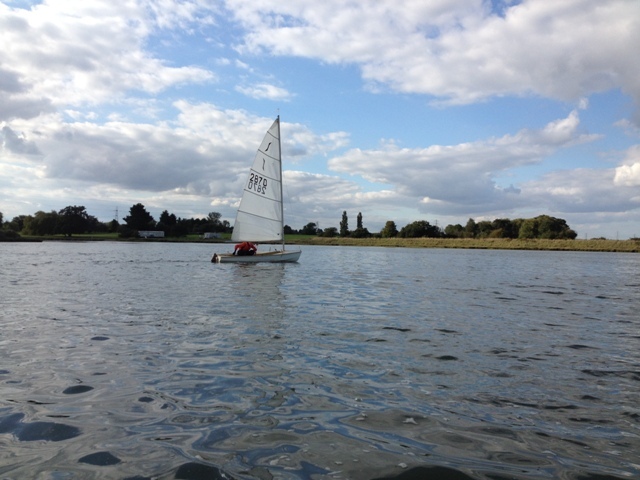 There was very little wind, and because it was relatively calm I had deliberately left the sailing rig at home. 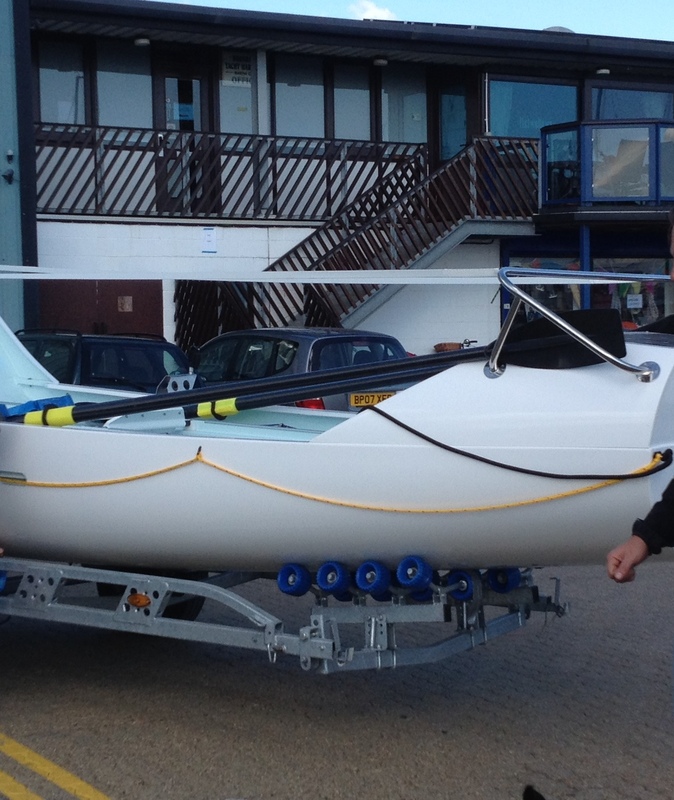 Rowing would be fun. Indeed, it was, and with Rat and Mole beside me, what could go wrong? 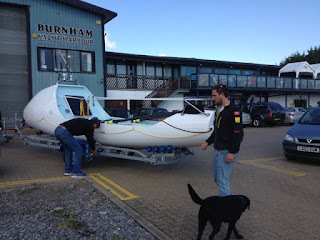 Before I knew it, three hours sped by, and there we were back at the slipway. I said goodbye to Rat and Mole, and thanked them for showing me the importance of NOT being earnest and of not being bothered if objectives are not achieved. In fact, why have objectives at all? – Far better to have happenings. 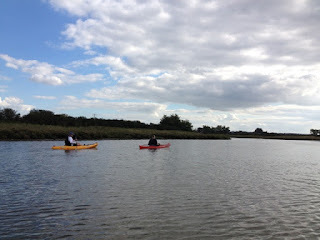 Without trying, we merrily made it to Battlesbridge, only once drifting into reeds and surviving in the wake of a speeding motorboat and not colliding with a silent dinghy or being attacked by angry swans. As for Pike and me, we would do it again any day with Rat and Mole as our companions. 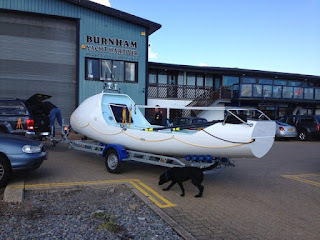 One of the blogs he follows is Triloboats. *** This complements Dave Zeiger’s and Anke Wagner’s website with the same title. It gives details of ‘Slacktide’, their self-designed and home-built T26 Triloboat, aboard which they live. 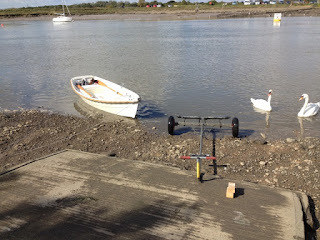 Their Triloboat 16 x 4**** would appear to be the smallest of the range. 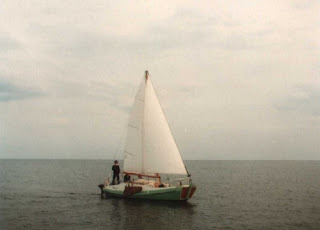 Jim Michalak was influenced by Phil Bolger. 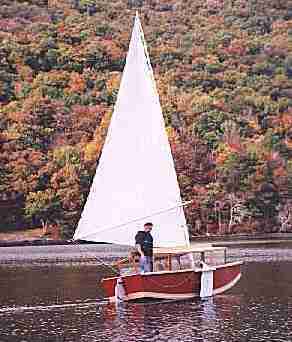 He designed Dean’s Box, a 16’ open scow. Describing the boat he explains how she is in keeping with Phil Bolger’s theory of rocker curve matching side curve for minimizing swirling around the chines. His Pencilbox with minimal accommodation for two, also accords to the Bolger theory – likewise does his Jewelbox Jr. 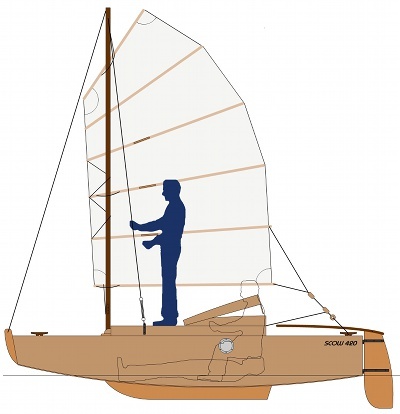 There is a cross-pollination of ideas and concepts shared between sailboat designers, and by looking at Sven Yrvind’s ideal small ocean sailboat (last Link) one can see similarities between her and some of the scows mentioned above. She is box-like, with moderate rocker, and has rounded chines and a snub bow. 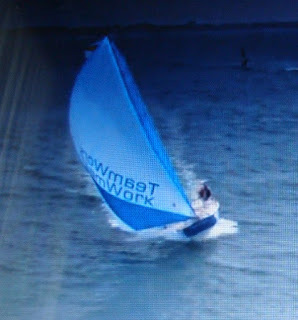 Although Sven is not into speed sailing, I feel sure he would be aware of the success of the scow ‘Teamwork Evolution’ that competed in the Transat 6.50 which has a similar rounded bow to that of his ideal small ocean sailboat. Finally, have a look at John Hawes’s Madrigal, a scow-like 22’ sailboat with characteristics similar to those of a Dutch Botter. 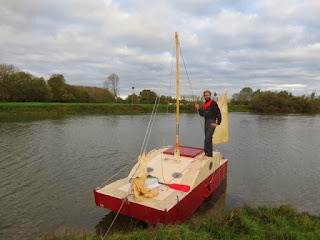 Further to my article of yesterday about ‘Gorfnik’ I’m adding a few links that will take readers to websites featuring similar boats. Thank you Brian for providing your links in yesterday’s Comments section. The history of this type of micro-sailboat must go back to Derek Van Loan’s ‘Sleeper’,* the "Swiss Army Knife of Boats", or possibly a cabin version of Bolger’s ‘Brick’ – I’m not sure which came first. 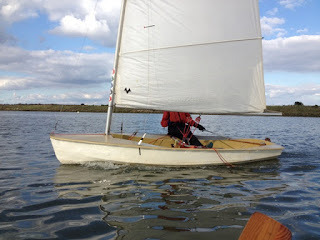 There’s a chap who added a deck to an Optimist dinghy that he uses for cruising, but I can’t find information about his exploits. Does anybody have any knowledge of him and his boat? I thought I saw a video on YouTube showing the boat under sail, but I can’t find it.